or Bleuette whose height varies from 27 to 29 cm. C043, C040, C041, C044 and C039. 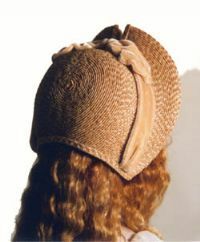 Our poplular hat is now available in smaller sizes. 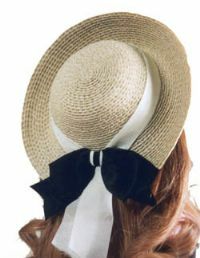 The front and sides of this classic straw hat are tipped up and the back is tipped down. It may be decorated with a ribbon around the crown, ending in tails. A contrasting bow may be placed over the tails. 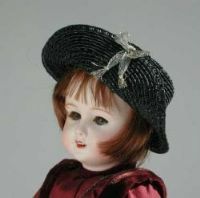 This hat works well on both modern and antique dolls. 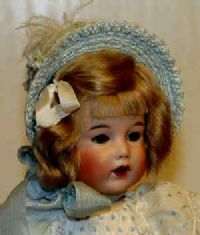 For dolls with a head circumference of 6.25-7.25 inches; fits Bleuette and Dianna Effner 10 inch contemporary dolls. Fits Bleuette and Dianna Effner 10 inch contemporary dolls with a height of 10 inches and a head circumference of 6-7 inches. This is a hat for Bleuette or other small 10 – 11 inch dolls. The crown is a little higher in the front than in the back. The brim is also wider in the front. 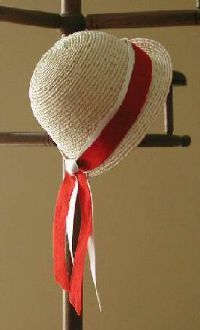 The front brim is tipped back to the crown and decorated with a simple tied bow. This fits a doll with a head circumference of 6-7 inches. 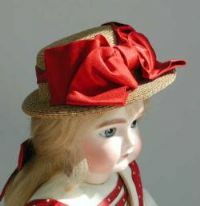 This is another hat for Bleuette or other small 10 – 11 inch dolls. The front brim of this classic straw hat is tipped back. 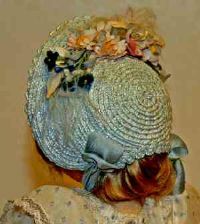 It may be decorated with vintage cotton flowers to coordinate with the dress, or made from the same goods as the costume. The crown is slightly rounded on top. Finish decorating with silk ribbon loops on the sides, using the same ribbon for the ties. A small spray of feathers may also be added. This fits a doll with a head circumference of 6-7 inches. Pictured on Bleuette, also fits Dianna Effner 10 inch contemporary dolls. This cute cloche hat is designed to fit Bleuette, the new Seeley's Lady dolls, and Dianna Effner's 10-inch dolls or any doll head with a circumference or 6-7 inches.